Chicken Spaghetti is one of those recipes you can never get enough of! Seriously, once you taste a bite you won’t be able to stop eating. 🙂 It’s a creamy and delicious main dish with chicken, spaghetti, lots of cheese, three creamed soups: chicken, mushroom & celery, a can of Rotelle diced tomatoes with green chilies, sliced mushrooms, garlic, diced red onion, and diced red pepper or pimientos–either one works well. It’s absolutely superb. While Chicken Spaghetti is not particularly healthy since it uses canned soups and processed cheese (although I’ve used regular cheddar cheese with good success in this recipe), it is still one of the most amazing comfort foods you will ever eat. Every forkful of this tasty main dish slides down your throat with just a little kick from the diced chilies and the creamy gooeyness from the soups and cheese. I’ve made this recipe countless times to take as meals for people and without fail it always pleases. Chicken Spaghetti does have a lot of ingredients and takes some time to prepare. I usually cook off a whole chicken in my crockpot which means deboning the chicken later, but this large recipe produces two 9×13″ casserole dishes. So it’s easy to make for your family and give a pan to someone else–or place one in the freezer for later. If you need pointers on deboning a chicken check out my post here. 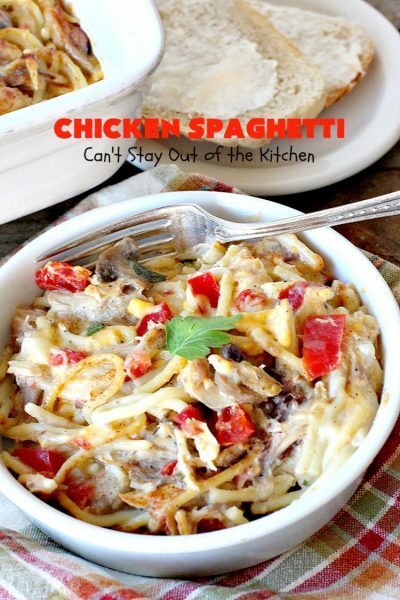 You can heat Chicken Spaghetti in the crockpot or bake it in the oven once assembled. Both ways work very well. However, if you’re short on time, you can just as easily substitute pre-packaged cut-up chicken and chicken broth with the same great results. That will cut down your time significantly. This is a great dish to prepare on the weekends and then cook during the week. You can prepare it 24 hours before you bake it, if necessary. Or, as I stated earlier, cover with foil and freeze until you’re ready to bake it. 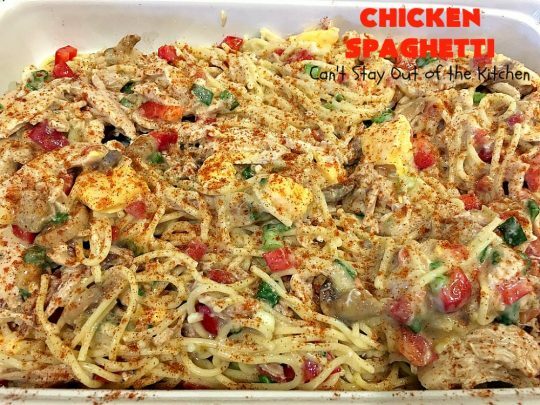 Chicken Spaghetti is a great main dish to take to potlucks, family reunions, or to prepare when you’re having a lot of company. As I stated earlier, it’s also great as a main dish to prepare when you want to provide a meal for a family who’s grieving, where there’s been sickness, the birth of babies or when someone’s adopted a child, when friend’s or family are moving, or when friends are going through family issues and a meal is really appreciated. It’s been one of my go-to recipes for taking a meal to others for years now. Not because it’s quick and easy, but because it makes a lot, and it has such a wonderful taste almost everyone always enjoys it. So, if you’re looking for a great Tex-Mex recipe that’s not too spicy consider giving Chicken Spaghetti a try sometime. 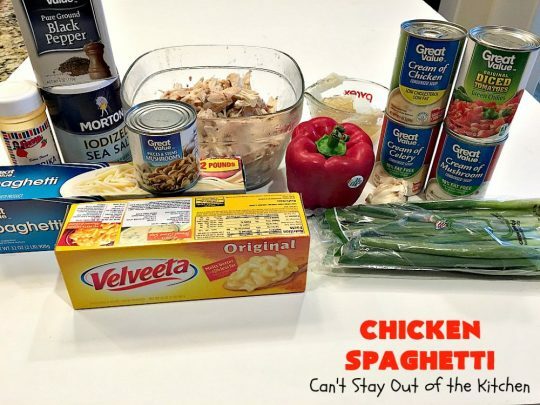 You can cut this recipe down if need be, by removing one of the soups, using about 4 cooked boneless chicken breasts or canned chicken, and decreasing all the other ingredients as necessary. This is one of those recipes that doesn’t have to be so precise in the ingredients. Mix in the amounts you want. But if you know you need a freezer meal in advance, it’s really nice to make this recipe up and freeze half of it for later. Or you can make up a batch for yourself and give the other pan to someone else. Be prepared to be licking your lips after eating this tasty entree. It is so-so good. When I initially posted this recipe in October 2013, I had made it for a family in our church that had just moved to the area. I was making so much food that day that I really didn’t take enough time with the pictures. By my standards they were mediocre at best. Since this is a blog about food, it’s important that the pictures look a lot better than my original ones did. I recently remade this recipe (February 2018). I made one casserole and served it as a meal for the youth for our church’s Disciple Now Weekend. I froze the other casserole for a week before using it. I defrosted it in the refrigerator about two days before cooking it. I set it out of the refrigerator about an hour to get it closer to room temperature. Then I baked it for about 1 hour 45 minutes before I felt like it was heated through enough. I served it to our Friday night Care Group and everyone raved over it. One gal had three servings of this entree. Since she’s a little on the pickier side, I thought that was high praise indeed. 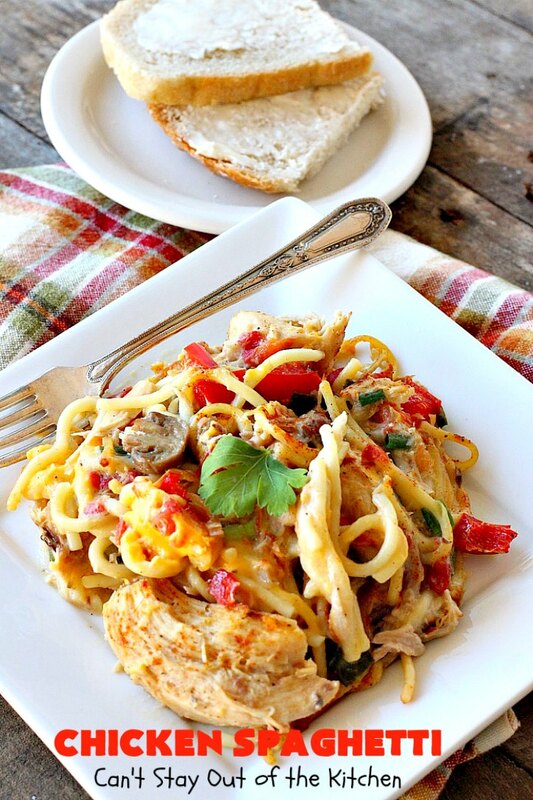 If you want a different take on spaghetti, you’ve got to give this “Tex-Mex” Chicken Spaghetti a try sometime. It’s awesome. 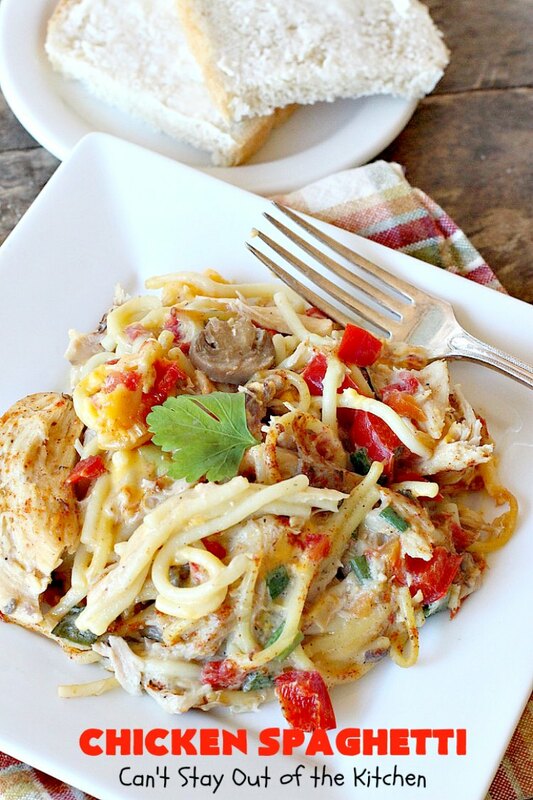 Chicken Spaghetti is a creamy, delicious main dish with just a touch of heat. 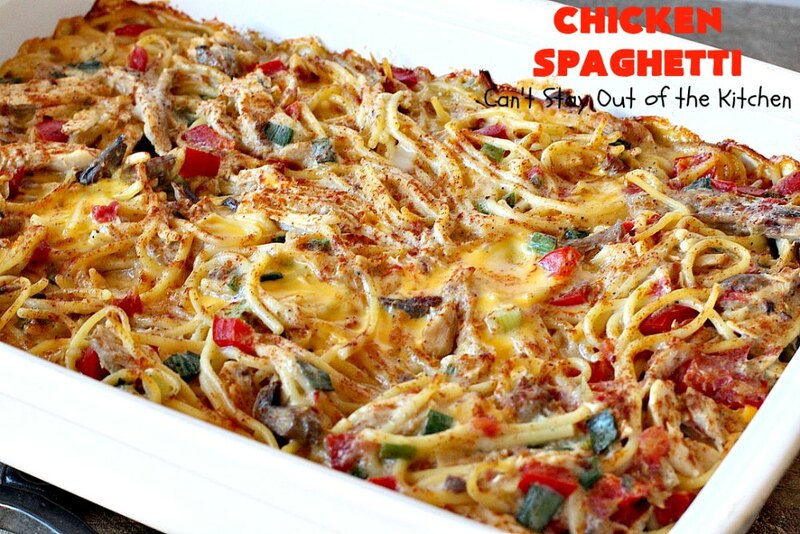 Chicken Spaghetti makes so many servings that it’s the perfect dish for company or potlucks. 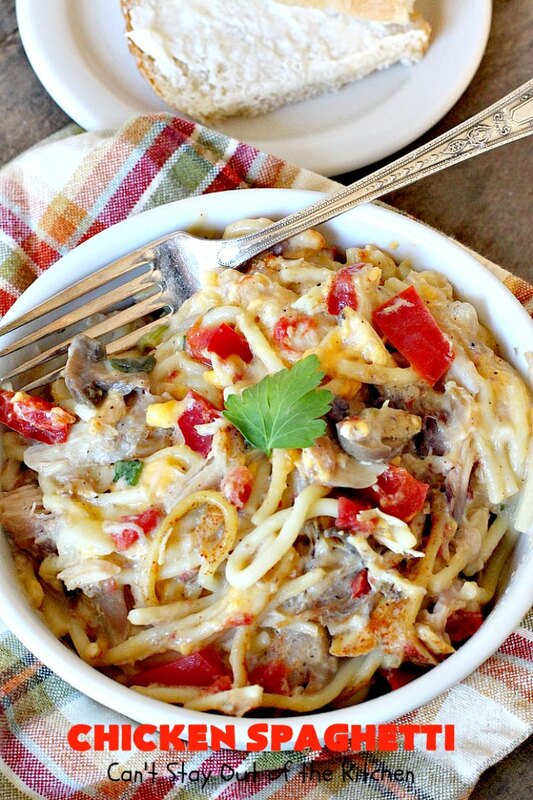 This pasta dish is succulent and mouthwatering. I used these ingredients. The glass dish contains previously cooked and deboned chicken. The pyrex measuring cup contains homemade chicken broth. I also used broth to cook the spaghetti noodles in. You can substitute pre-packaged pre-cut chicken pieces and chicken stock if you don’t have time to cook off a whole chicken for this recipe. Otherwise, cook off a whole chicken, debone and break chicken up into bite-sized pieces. Reserve all the broth. Here are Tips for Deboning Chicken if you need them. One whole chicken will usually yield 4-5 cups meat. Reserve 1-2 cups chicken broth for recipe. Place remaining broth in a large stockpot with water and bring to a boil. Break spaghetti pasta into thirds with your hands. Add to boiling broth/water mixture and cook until done. Run cool water over noodles and add some ice cubes to stop the cooking process. Drain thoroughly. Divide cooked chicken in two large mixing bowls. Divide spaghetti and place half in each mixing bowl. To each mixing bowl, add half the tomatoes with green chilies, half the mushrooms, half the velveeta cheese cut in cubes, half of the cream of chicken, cream of mushroom and cream of celery soups and half of the chicken broth. Add half of the diced red onion or green onions in each mixing bowl. Add half of the diced red bell pepper or pimientos in each bowl. Add half of the minced garlic to each bowl and sprinkle with salt and pepper to taste. Spray two 9×13″ glass baking dishes with cooking spray. 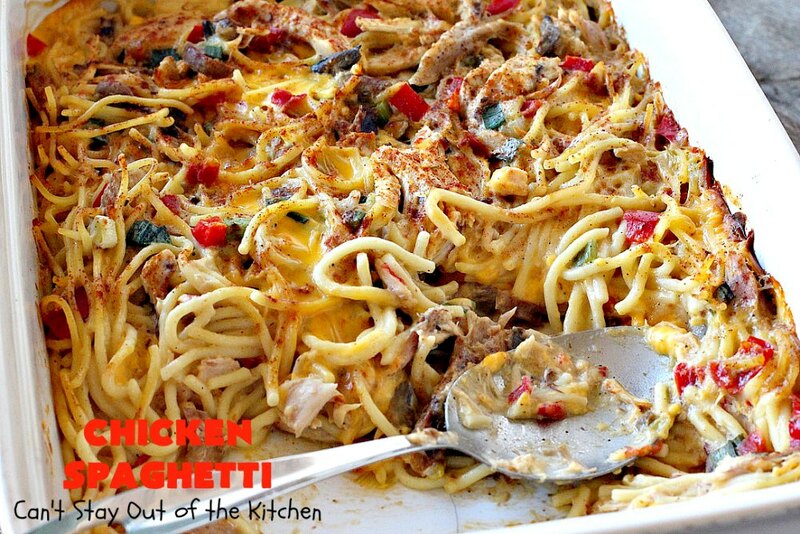 Divide the Chicken Spaghetti mixture between each pan. Sprinkle the tops of each casserole generously with paprika. You can freeze one of the casserole dishes for later use if you prefer. Thaw before cooking. It may take almost 2 hours to bake the casserole if it’s cold before cooking. 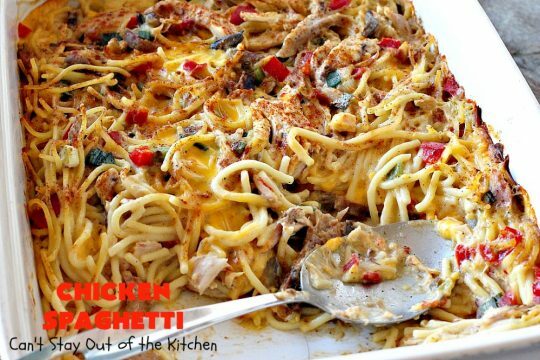 Cover casserole with foil (otherwise the noodles on top will dry out). Bake at 350 about 40-45 minutes or until hot and bubbly. Remove foil and place casserole back in the oven to brown the top about 5 minutes longer. It’s time to dig in! 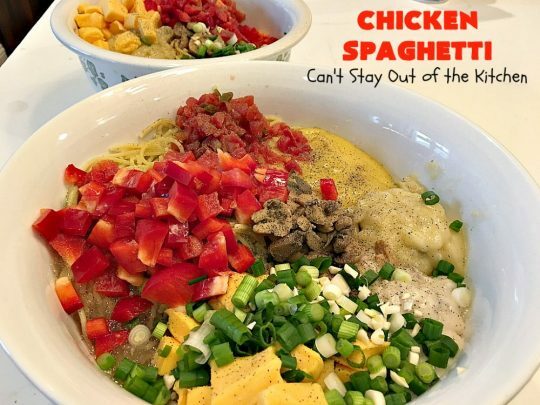 Serve Chicken Spaghetti in bowls. Sprinkle with more paprika, pepper, and fresh parsley, if desired. 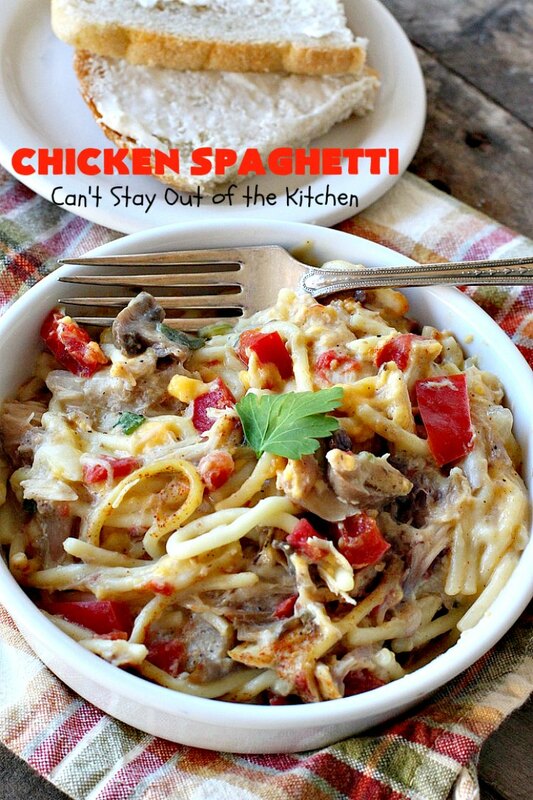 Even the most finicky eaters love Chicken Spaghetti! Great Tex-Mex recipe using cooked chicken, spaghetti, cheese, cream of chicken, mushroom, and celery soups, tomatoes w/green chilies, mushrooms, garlic, onion, and red pepper or pimientos. This recipe makes two large 9x13" casserole dishes. This can be cooked in the crockpot or the oven. It's terrific for large company dinners or potlucks. 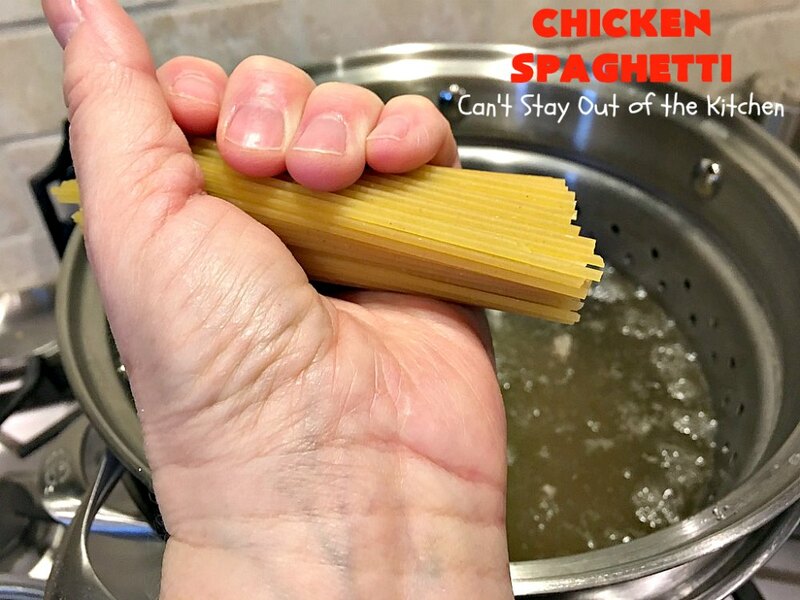 Break spaghetti noodles into thirds and boil in mixture of chicken broth and water until done. Drain. Run cold water over top of the spaghetti to stop the cooking process. 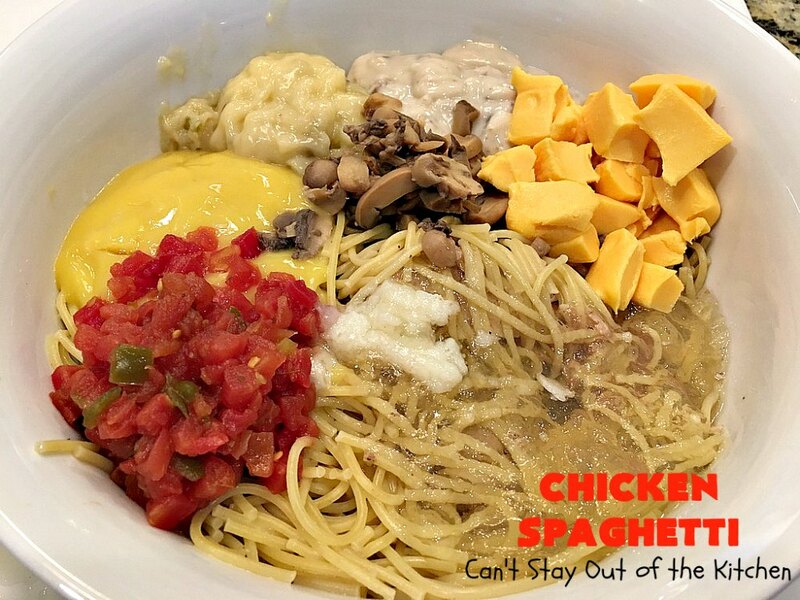 In two large mixing bowls, combine chicken, spaghetti, soups, Rotelle tomatoes with diced chilies, Velveeta, chicken broth, mushrooms, bell pepper, onions and garlic. Sprinkle generously with salt, pepper and paprika and stir together. If baking in crockpot, pour ingredients into crockpot and sprinkle paprika also on top and cook on high about 3 hours or until bubbly. Stir several times throughout cooking time. If baking in oven, spray two 9x13" glass baking dishes with cooking spray. Divide mixture between two casserole dishes. Sprinkle paprika on top and cover with foil. Cook 35-45 minutes at 350 or until bubbly. Remove foil and brown top about five minutes longer in the oven. 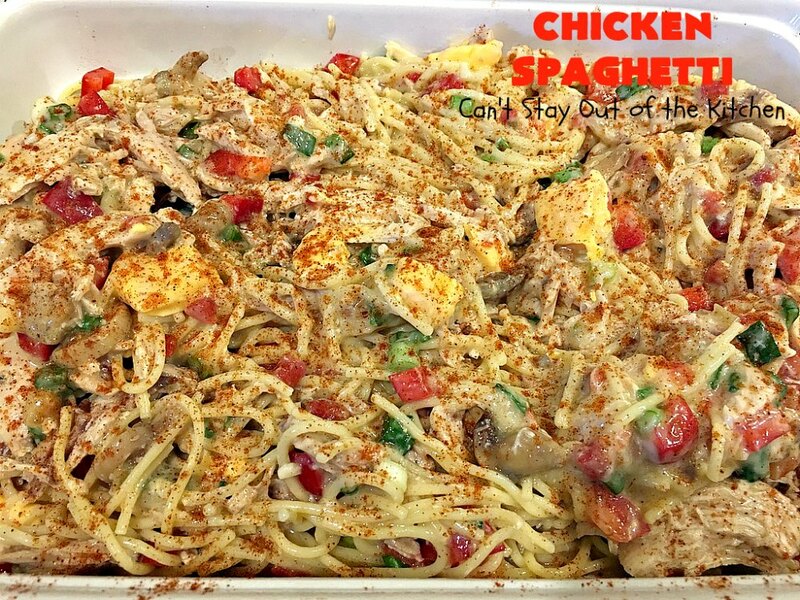 To serve: stir Chicken Spaghetti and place in individual bowls. Sprinkle with additional pepper, paprika and garnish with parsley, if desired. NOTE: This recipe works best if you break up the spaghetti noodles before boiling. Once the noodles are cooked, drain and add ice cubes to stop the cooking process. Then drain again. NOTE: This recipe works with Velveeta cheese or any kind of sharp cheddar, or Colby Jack cheese. 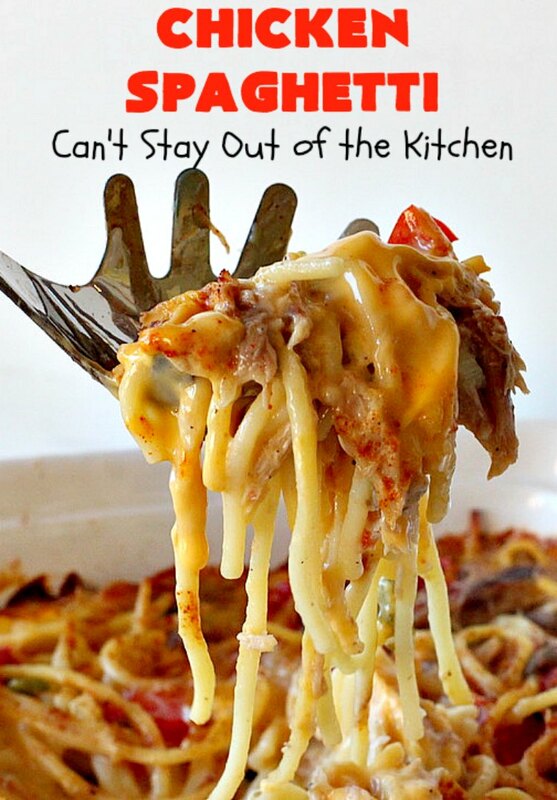 You can also use habanero cheese or Taco cheese. NOTE: Preparation time does not include time to cook or debone chicken. NOTE: You can substitute pre-packed pre-shredded chicken and chicken broth for the deboned chicken in the recipe. NOTE: If you choose to freeze a casserole, remove to refrigerator to thaw two days before cooking. Allow casserole to sit out on counter about an hour before baking if possible. Then bake casserole about 1 1/2 to 2 hours until mixture is bubbly and heated through in the center. Remove foil and bake 5 minutes to lightly brown the top before serving. NOTE: I used about 2 quarts chicken broth with about a gallon of water to cook the spaghetti noodles in. NOTE: You can easily halve this recipe and make only a single 9x13” dish. 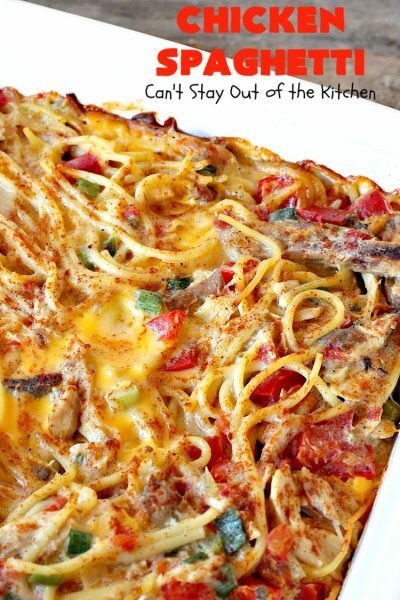 Great Tex-Mex recipe using cooked chicken, spaghetti, cheese, cream of chicken, mushroom, and celery soups, tomatoes w/green chilies, mushrooms, garlic, onion, and red pepper or pimientos. This recipe makes two large 9×13″ casserole dishes. This can be cooked in the crockpot or the oven. 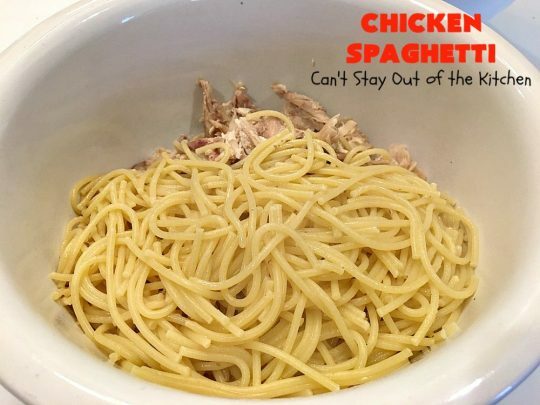 Combine chicken, spaghetti, soups, Rotelle, velveeta, chicken broth, mushrooms, bell pepper, onions and garlic in crockpot or large baking roaster pans. If baking in crockpot, sprinkle paprika also on top and cook on high about 3 hours or until bubbly. If baking in oven, spray two 9×13″ glass baking dishes with cooking spray. Sprinkle paprika on top and cover with foil. This recipe works best if you break up the spaghetti noodles before boiling. Once the noodles are cooked, drain and add ice cubes to stop the cooking process. Then drain again. [br][br]This recipe works with Velveeta cheese or any kind of sharp cheddar, or Colby Jack cheese. 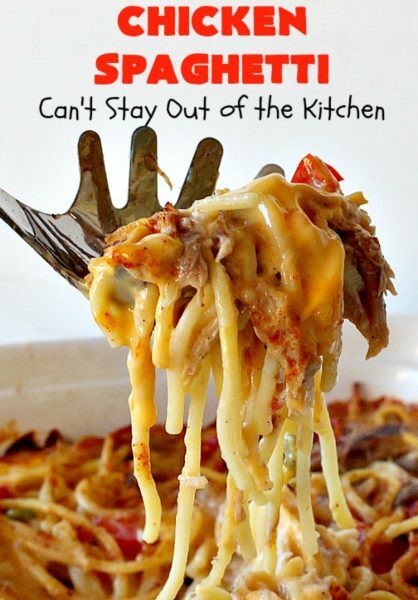 You can also use habanero cheese or Taco cheese. 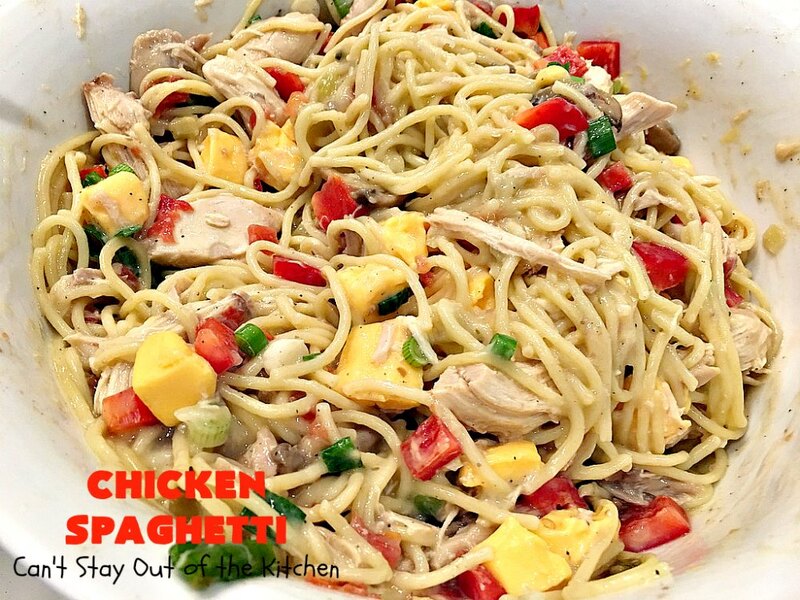 Chicken Spaghetti is a very kid-friendly dish. Everyone loves this recipe! Here’s a forkful for you to taste! It’s very cheesy and creamy. Add your favorite bread and you have a delightful main dish entree.